11-Jul-2004 -- On 09 July 2004 my friend Helmut was pushing me to visit the confluence 9N 6E. He located the Confluence from a map, which was published in 1969, and the location seemed not to be too far from roads. Helmut is a very experienced bushrider, living and working since several years in Abuja, the capital of Nigeria. He is going almost every weekend to the bush with his motorbike and he is an expert in routing. After extensive additional planning in the night of 10 July 2004, we left Abuja at approx. 07:30h on 11 July 2004 heading for Suleja in Niger State. From there we followed the road to Lambata, Lapai, Agaie, and via Badeggi to Bida. Before Bida, we passed the Polytechnic and left the tarred road and entered a bush road. We had borrowed our GPS from a friend, but nobody of us could operate it. We could not enter the Confluence as a waypoint. So we tried to navigate with our map (at least Helmut did) and tried to get closer to the target. 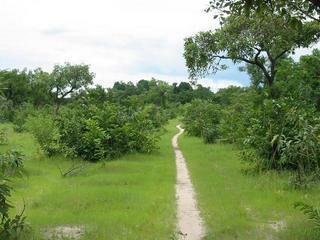 We followed several bush roads or even footpaths and asked several people for our way. We were looking for a village named Lanlegi. Nobody knew it. Finally somebody directed us to a Lanlegi forest. Obviously the village is no longer existent. It was really difficult to navigate and we were about to return to Abuja. But suddenly, a surprise. Helmut managed to enter the waypoint into our GPS and it was showing our position, distance, and direction to the Confluence. But Helmut could not say how he did it. So we followed our way via bush roads and footpaths and got closer to the Confluence. Helmut and I left the car when the bush got thicker and followed the track by feet. But there were always some footpaths and even the car managed to follow. The distance to the Confluence was about 2.5 km. After a short walk we reached the Confluence and celebrated the visit with a cold drink. The area at the Confluence consists of light bush land, bushes mainly up to 2 meters high, occasionally also higher trees. In between some grass and sometimes laterite soil. Close to the Confluence a footpath is passing which some Fulani women frequented. After taking some photographs we headed back to Abuja.